Cozy up with these beautiful blankets. Parents need two things to function: Coffee and sleep. The latter is tougher to come by, and that’s why you need a great comforter. In fact, the right down or down alternative comforter might just make you surgically attached to your bed. If you’re on the hunt for the perfect comforter, you’re wondering what sets one apart from another. Down or down alternative are the most popular types of comforters. But once you’ve narrowed that down, you’ll still need to consider weight, construction, size, and your sleep preferences, of course. Down alternative is also a great option at a more affordable price point, Kane continued, and these products, often made from microfiber, can be just as soft and warm as their goose down counterparts. When you’re scouting out the best blanket, be sure to read the label to find the percentage of down fill, as the higher that number, the better the quality. The insulation ability of the down is also known as “fill power,” which is the amount of space an ounce of down “fills” in cubic inches. The higher the percentage, the greater the insulation you’ll enjoy. The comforter’s construction is another important factor. Ring stitching allows down to shift within the blanket, which can lead to all those feathers or fibers bunching up in one area. Channel construction consists of long columns that run the length of the blanket. Again, feathers can migrate, leaving you cold as bare spots form when feathers shift. Baffle box, widely considered the best construction style, ensures that the down stays where it should by trapping it inside individually stitched boxes. Lastly, you’ll need to think about the size of the comforter. While it may seem logical to purchase the one that corresponds to the size of your bed, this is a case where bigger is better. We rounded up the best comforters on the market across a range of price points that all but guarantee a great night’s sleep. This comforter is made from ultra-light premium eucalyptus fibers, and won't weigh you down. Pros: This is the perfect down alternative comforter for those of us who tend to get hot at night. It has a eucalyptus fabric shell, which is moisture-wicking. Meaning, no more night sweats. Cons: It can be too flat for some, and too warm for others. 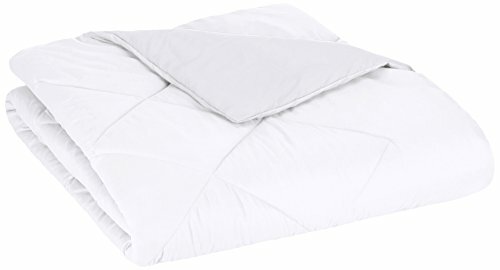 The upscale bedding brand's duvet inserts are made with 750 fill power European white down, which is fluffy and warm. Pros: This is the king of down comforters. You can choose your preferred density level, choosing between all-year or seasonal. 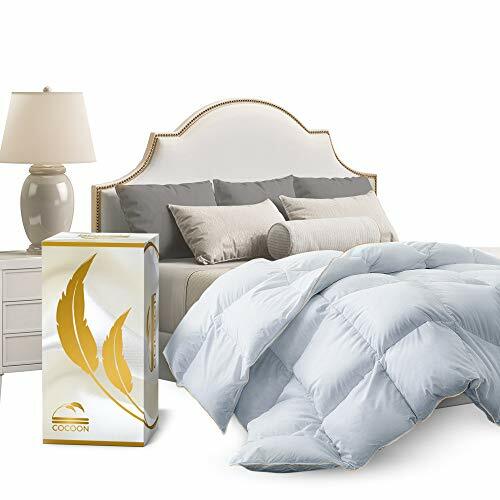 The comforter is made of premium European white down, it’s machine washable, and has a sateen cotton outer shell that feels cool against your skin. Cons: It will last you years, but it’s not cheap. Filled with plush microfiber, this down alternative comforter is hypoallergenic. Box stitching ensures that fill doesn’t shift, providing even warmth. Pros: With more than 6,000 positive reviews on Amazon, you’ll be hard-pressed to find a comforter as beloved and affordable as this one. It’s reversible and comes in designs so attractive, you can skip purchasing a duvet cover. The filling on this comforter is microfiber. Cons: Machine-wash at your own risk. 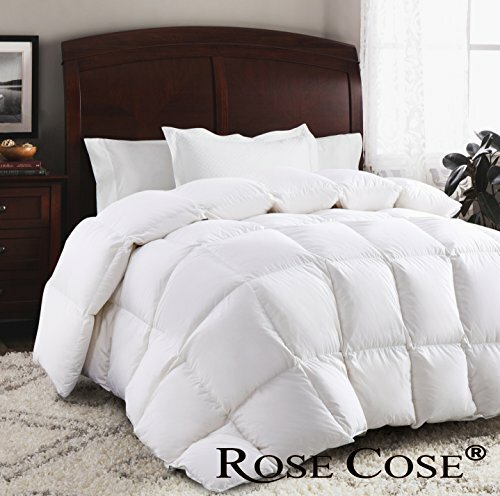 This luxurious comforter features a 100 percent cotton shell that boasts a 1200 thread count and is made from 100 percent goose down. Pros: Lightweight yet warm and cozy enough to use year-round, the comforter doesn’t crinkle as your roll around, which is a relief to sleepers who are sound-sensitive. Cons: This comforter needs to be dry-cleaned, which can get expensive and you may miss it while it’s gone. With this comforter, you get 1200 thread count with 750+ fill power, equalling serious comfort. 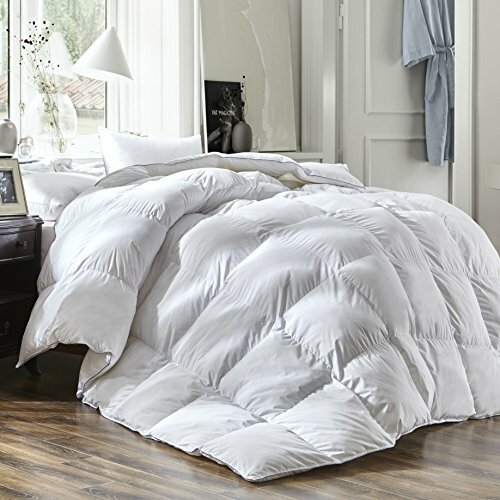 Pros: This glorious down comforter has a hypo-allergenic fill is made from premium down goose feathers. And it’s ideal for year-round use, meaning you won’t freeze or overheat. Cons: It can be too scratchy for some, and has a smell that some found off-putting. 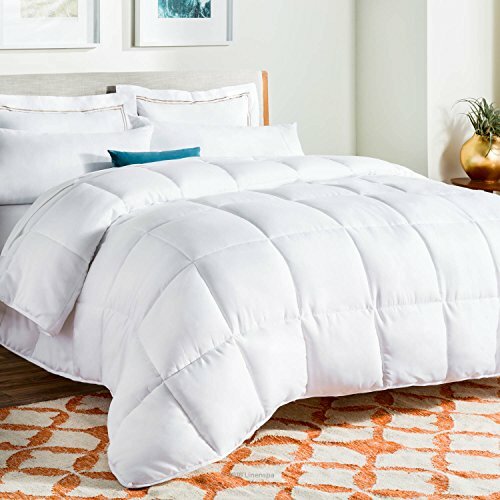 This comforter is a blend of goose down and down alternative, so you get the best of both worlds. Pros: This down and down alternative comforter features a handy box stitching design to avoid any shifting of the filling, and it is machine washable. It’s soft, it’s cozy, and it’s great for use all year. Cons: It’s thin and scratchy, according to some naysayers. We've had a lot of luck with Amazon's in-house brand, and this comforter is no exception. It's solid, for a stellar price. Pros: This comforter is made from polyester, features diamond stitching helps keep the fill in place, and is machine washable. It comes in a variety of colors, and the price can’t be beat. 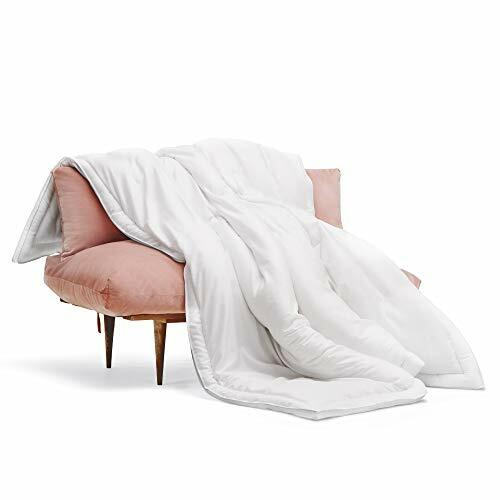 It’s not a luxe down comforter by any means, but will keep you warm. Cons: You get what you pay for. The comforter tears easily, and the quality can be iffy.